Smog engulfs parts of northern China Jump to media player Parts of northern China have suffered the worst bout of smog since July, pushing pollution well past healthy levels and reducing visibility. Martin Patience reports from Beijing. 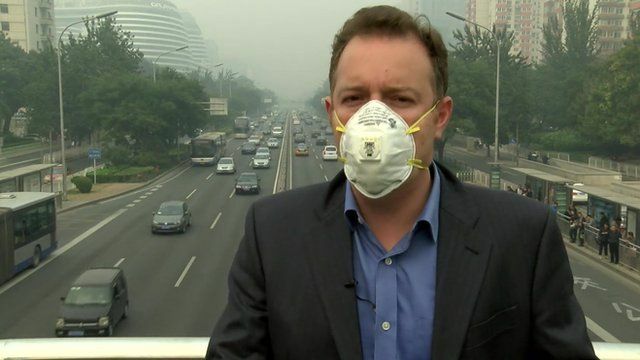 How China is trying to battle smog Jump to media player David Shukman looks at why smog in China's cities is a growing threat to public health, and what efforts are being made to fix the problem. China smog 'is health crisis' Jump to media player The smog that is affecting much of Northern China has been described as an environmental crisis by the World Health Organisation. Parts of northern China have suffered the worst bout of smog since July, pushing pollution well past healthy levels and reducing visibility. Martin Patience reports from Beijing.